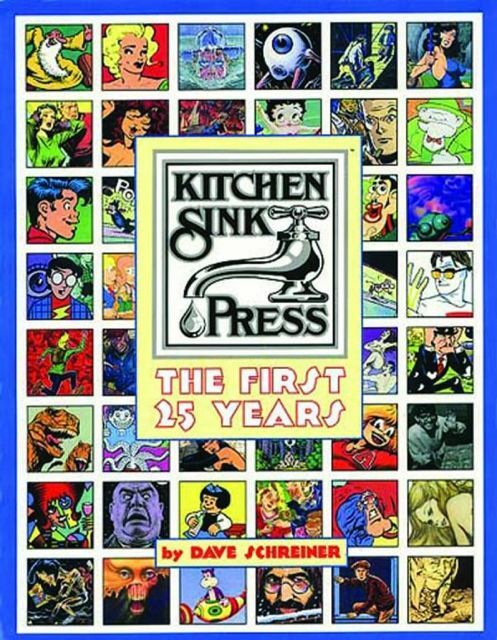 A complete retrospective of pioneer independent publishing house Kitchen Sink Press, from its inception in 1969 through its silver anniversary in 1994. This full-color history is profusely illustrated with underground comix, graphic novels and offbeat merchandise, plus previously unpublished art by R. Crumb, Mark Schultz, Peter Poplaski, Frank Stack, Reed Waller, and others. Included are 'sidebar' columns by Alan Moore, Will Eisner, Art Spiegelman, Stan Lee, Will Elder, Howard Cruse, Trina Robbins, Jay Lynch, Kevin Eastman, founder Denis Kitchen and other luminaries reflecting on the impact of this early and long-running alternative company. A must-have item for fans of Kitchen Sink, underground comix, and cartoon history.